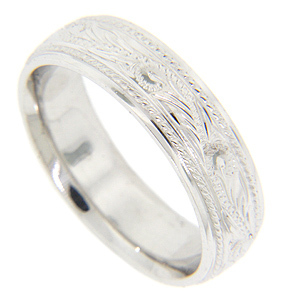 An undulating line is worked down the center of this 14K white gold antique style men’s wedding band. Stylized engraving fills in the space around the curving line. Simple milgrain patterns frame the central design while smoothly polished edges frame the whole. The band measures 6.04 mm in width. Size: 10. Cannot be re-sized, but we can reorder the ring in any size and in white gold, yellow gold, platinum or palladium. Price will vary depending on metal and size.